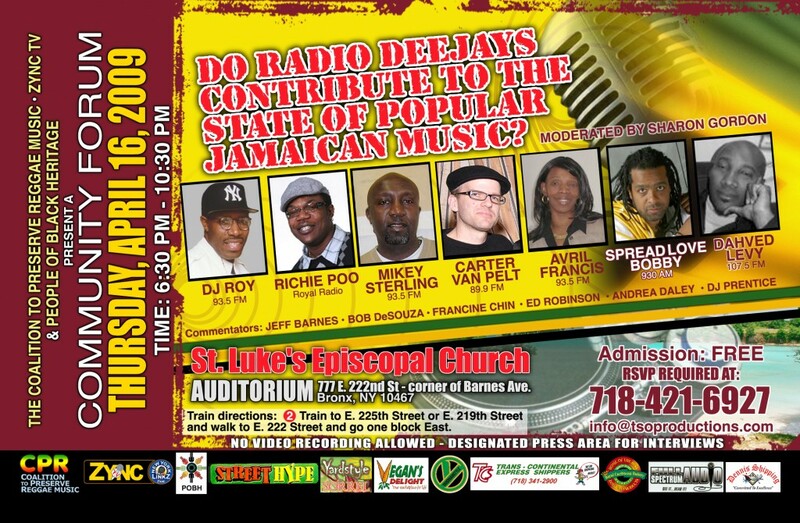 That’s the question on the table for the upcoming community forum and panel discussion hosted by the Coalition to Preserve Reggae music (CPR), in association with ZYNC TV NEW YORK LINKZ and People of Black Heritage on Thursday, April 16th in the auditorium at St. Luke’s Episcopal Church, 777 East 222nd Street, corner of Barnes Avenue in the Bronx from 6:30pm to 10:30pm. “There is growing concern over the sexually explicit and strongly violent lyrics that are being incorporated in popular Jamaican music and then aired on radio and television”, said Carlyle McKetty, co-founder of the Coalition to Preserve Reggae music. The forum promises keen insight into this question. Panelists for the Bronx forum include Dahved Levy of WBLS (107.5 FM), DJ Roy of Irie Jam on WVIP (93.5 FM), Mikey Sterling of R5 Radio on WVIP (93.5 FM), Avril Francis of ER Radio on WVIP (93.5 FM), Carter Van Pelt of WKCR (89.9 FM), Spread Love Bobby on WPAT (930 AM) and Richie Poo of Royal Radio (106.3 FM). To ensure that the discussion stays on message, CPR has tapped an impressive group of industry insiders to serve as Commentators for the evening. They are radio legend, Jeff Barnes, shipping magnet and radio host, Bob DeSouza, radio host, Francine Chin, singer/ drummer/ producer Ed Ed Robinson, journalist Andrea Daley and the well known DJ Prentice. Sponsors of the event include Street Hype Newspaper, Caribbean Food Delights, Yardman Style Clothing, Dennis Shipping, Vegan Delight’s, Transcontinental Shippers and Yardstyle Sorrel. Due to limited space, attendees must RSVP at info@tsoproductions.com or call 718-421-6927. About People of Black Heritage: People of Black Heritage (POBH) is a 501(c) (3) Not-for-Profit Organization formed in 2007 with the exclusive intent of serving as a charitable and educational organization. Its mission is to provide community based support services that will empower and enhance the quality of life of underrepresented inner-city residents.